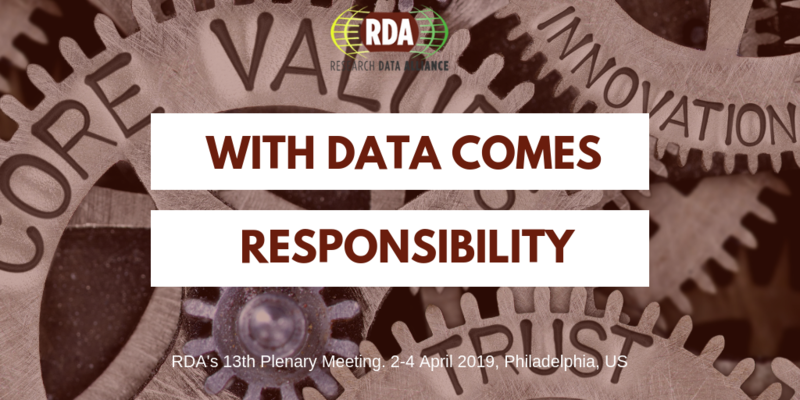 RDA Thirteenth Plenary Theme: "With Data Comes Responsibility"
Home » 13th Plenary Meeting » RDA Thirteenth Plenary Theme: "With Data Comes Responsibility"
Ils doivent envisager qu’une grande responsabilité est la suite inséparable d’un grand pouvoir. (English translation: They must consider that great responsibility follows inseparably from great power. Of course, a derivation was made popular in the Spider Man movie of 2002, which stemmed from the August 1962 issue of the comic book - “Amazing Fantasy”. But what does it all mean? Responsibility by definition is the ‘state or fact of having a duty to deal with something’ and ‘the state or fact of being accountable or to blame for something’. It is in these definitions we now delve as we enter the second decade of the ‘data deluge’. This time when power has moved from people to data and back. Where are the problems, what are some solutions, and how do we move forward? Things start innocently as a problem beckoning for a solution. The problem is framed, questions are asked and answered, and judgments are made. From the moment a question is formed, however, there is room for bias. Inherent within a question is also what is absent from the responses and responders. The questions are naturally asked from a perspective that will be limited to the world-view of the humans generating them. The results will also be viewed and interpreted through the lens of the world-view of those with access to the data. Then the answers become data points, and there is room for bias. What does one keep as ‘good data’, what does one leave out? Data scientists make judgments based on these answers every day. Next, data points move to datasets, these datasets allow for algorithms, which have outputs that grow into decisions. Impactful decisions. And individuals and communities are omitted, excluded, misrepresented, misreported, and misinterpreted. Which is a mistake. Through this process, data (and data scientists) become more powerful, and ‘responsibility’ more elusive. Our P13 theme is to explore what this means for our community.The international, inter- and transdisciplinary nature of RDA has helped to lay a foundation for global partnerships and addressing responsibility across [throughout] the data-lifecycle and across all domains.